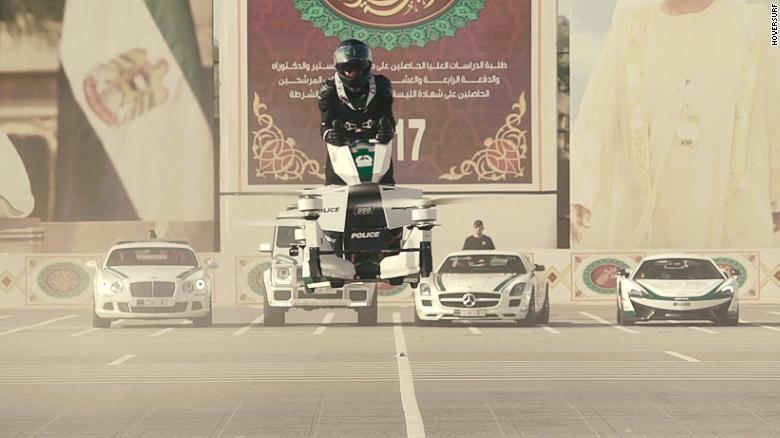 A year after California-based startup Hoversurf showcased its hoverbike at tech expo GITEX in the white and green livery of the Dubai Police, the company has returned with a new model and evidence its electric vertical take-off and landing (eVTOL) vehicle might be, well, taking off. 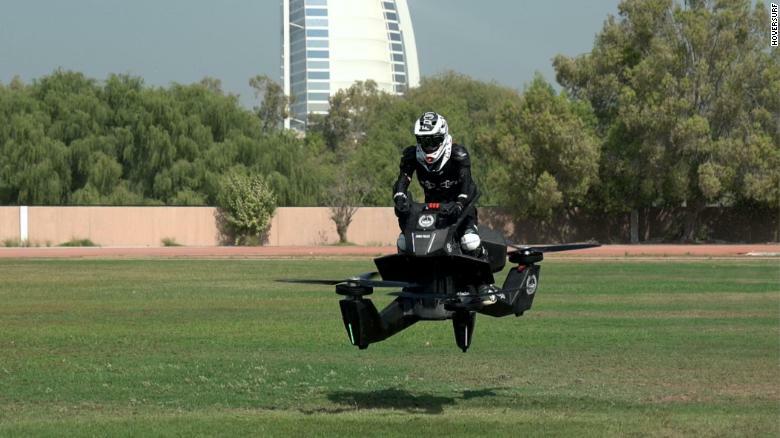 Making good on a deal signed in 2017, Hoversurf has now gifted Dubai Police its first serial production unit of the S3 2019 Hoverbike and has begun training officers to fly it. Brigadier Khalid Nasser Alrazooqi, general director of Dubai Police’s artificial intelligence department, described the eVTOL vehicle as a first responder unit used to access hard to reach areas. He said he aims to have hoverbikes in action by 2020. “Currently we have two crews already training (to pilot the hoverbike) and we’re increasing the number,” he told CNN. Hoversurf chief operating officer Joseph Segura-Conn explained that ideal candidates will be able to ride a motorcycle and have drone operating experiences. Video of one officer learning to pilot the hoverbike appeared online last month. If you’re not a member of the force and have a spare $150,000, the hoverbike could still be yours. Orders are open to civilians, but Segura-Conn cautions that buyers are screened to ensure they can handle the new tech. In the US, the hoverbike has met Federal Aviation Administration guidelines which mean you do not need a pilot’s license to fly the vehicle. He explained that eVTOLs are limited by current battery technology, but said advances — particularly in battery energy density, and introducing new materials like graphene — could increase flight times in the future. The S3 2019 in Dubai Police livery in the city in October. A manufacturing site for the S3 2019 is yet to be confirmed, but Segura-Conn said Hoversurf is in talks “with three companies in different locations around the world” — Dubai being one location. The S3 2019 joins an ever-growing crowd of eVTOL aircraft in various stages of completion. Earlier this year CNN took a ride in the Flyer by Kitty Hawk, another personal eVTOL aircraft that has jumped from rendering to reality. 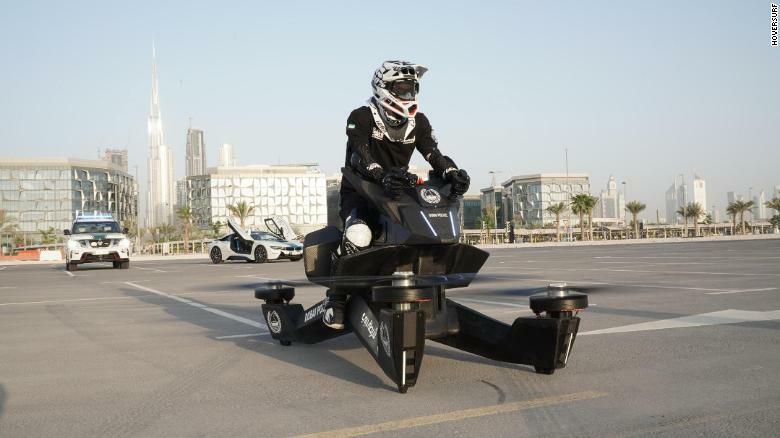 Hoversurf also has a bigger, two-seater flying car it plans to showcase in “four to five months” and sell in 2020, said Segura-Conn.
Dubai Police Brigadier Khalid Nasser Alrazooqi told CNN two crews are already training to pilot the eVTOL aircraft. Robinson estimated over 100 eVTOL or flying car projects have already been announced. He compared this period of frenzied activity and pioneering spirit to the early days of powered flight. “I think it’s a very exciting time — (a) great time — for innovations in the aerospace industry.